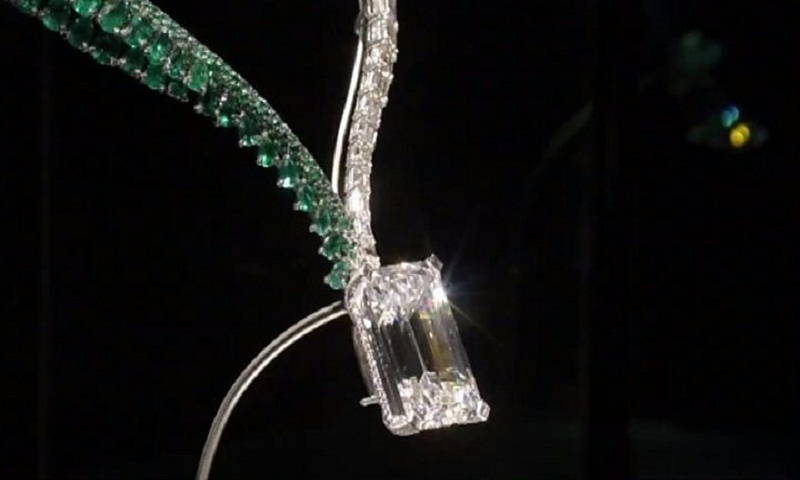 A diamond necklace featuring a flawless 163-carat diamond - the largest of its kind to be auctioned - has fetched $33.5m (£25.5m) at a Christie's event in Geneva. The colourless diamond was taken from a 404-carat stone found in Angola. The finished piece is made from white gold, diamond and emeralds. The necklace was designed by Swiss jewellery maker de Grisogono and took more than 1,700 hours to make, Christie's said. It went under the hammer at Geneva's Four Seasons Hotel following a series of public viewings in Hong Kong, London, Dubai and New York. The necklace, named The Art of de Grisogono, sold for $33.5m - $29.5m plus $4m premium - exceeding pre-sale predictions of $30m. The buyer's identity has not been revealed. On Monday a diamond known as the Pink Star sold for a record $83m (£52m) at auction in Geneva. That diamond measures 2.69cm by 2.06cm (1.06 inches by 0.81 inches) and was set on a ring. Previously, Christie's set an auction record in May 2016 with the sale of a 14.62-carat diamond known as the 'Oppenheimer Blue' for $50.6m (£34.7m).